Years ago when I was a Hillel Rabbi I had students come to me on different occasions asking for help creating Jewish content for their tattoos. They either wanted to know the spelling of a word in Hebrew,a Hebrew word for a central value of their lives, or even the meaning of Jewish symbolism of a tattoo they wanted emblazoned on their bodies. Do not make cuts and incisions in your flesh [to mourn] for the dead, in the manner that the Amorites do, because you are the children of the Omnipresent and it is appropriate for you to be handsome and not to be cut or have your hair torn out. As an Orthodox Jew I know that it is prohibited to get a tattoo. Since the Holocaust, the tattooing of numbers on the arms of Jews at the hands of the Nazis has taken the taboo of tattooing to new levels in the larger Jewish community. But it is interesting to weigh this value against my role as a community Rabbi helping people make enduring commitments that are personally meaningful, universally relevant, and distinctively Jewish. I would argue that a tattoo in its nature is distinctively not Jewish, but I see how someone getting a Hebrew word permanent printed on their flesh might disagree. Regardless one cannot argue that it surely an enduring commitment. In the Gemara Reish Lakish said to Rabbi Yochanan: Read the verse Lo Titgodedu– not as “you shall neither cut yourselves”, but rather you should not form separate groups (Yebamot 13b). In the years since that time I have seen a spike in tattooing in the larger society. What are the implications for Jewish life? Is it possible that in terms of how we are making enduring commitments to Jewish life we are forming separate groups? I can only imagine the conversations that you had with those college kids. 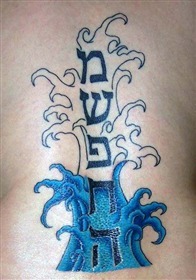 How ironic asking a rabbi for tattoo guidance! This was a favorite debate topic at Ramah. Certainly, I closed the debates with my personal view, echoing your sentiments, reasoning that over time, views change over time just like fashion statements. What we find spiritually uplifting when we’re 20 usually doesn’t work for us at 40. Keep on keepin’ on, Avi.